As we step into another exciting 2014 ,I am sure we will learn new things to believe in our own potential to explore and exploit digital ,Mobile & Social media effectively and collaboratively. As marketers , we need to engage more than before. We will need to let go of those old patterns & move on. Continue to apply tried & tested best practices to continue & sustain momentum. Be smarter by leveraging resources,tools & processes to drive digital eminence for your brand / company. Evangelization within our own marketing communities & colleagues. Driving- Hold the steering wheel too tight and can’t turn .let go! Trust the engine! Cycling – We don’t balance the bike. We balance ourselves .Get digital right & you will be riding off into the sunset! Swimming –You have to get wet to learn -No one ever learnt swimming by staying dry!! Jump in! 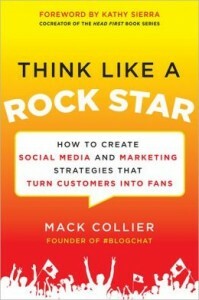 Mack Collier has hit a home run with his book “Think Like A Rock Star* and I really want all of you to get his message. Cheers! To a marketers journey! Have an exciting year & be a Digital Rockstar!